Right. The block carrier is almost done, I am going slower than I should at the moment, bit caught up with the final few chapters of my book and life but its just window dressing really. So I thought I would let you know what I have done up until now and then finish off tomorrow night or the night after with the final fiddlies and a couple of lovely final pics. This really wasn't too tricky at all. Its very straight forward, and how it looks at the end is all down to you. So, I am going to show you how I made this for me. What I did next. 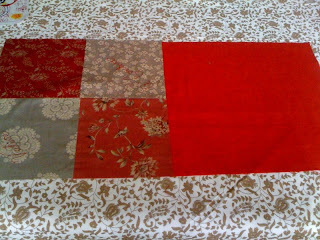 I decided that I might do something a little bit more interesting instead of just sewing all the red stuff together, so I went for sewing together the four squares. Wow, that was a big moment for the evening. Surprised that the police weren't called. Gave them a pressing and then joined that new square to one of the plain red squares (That I put the larger square of batting on the back of before hand). Big night at Jo's place. 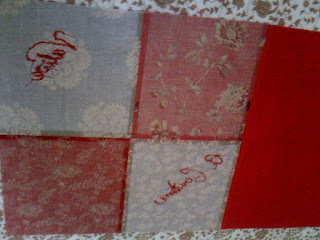 I then decided to really walk on the wild side, and I got out my Clover punch needle ... gasp ... and used it. 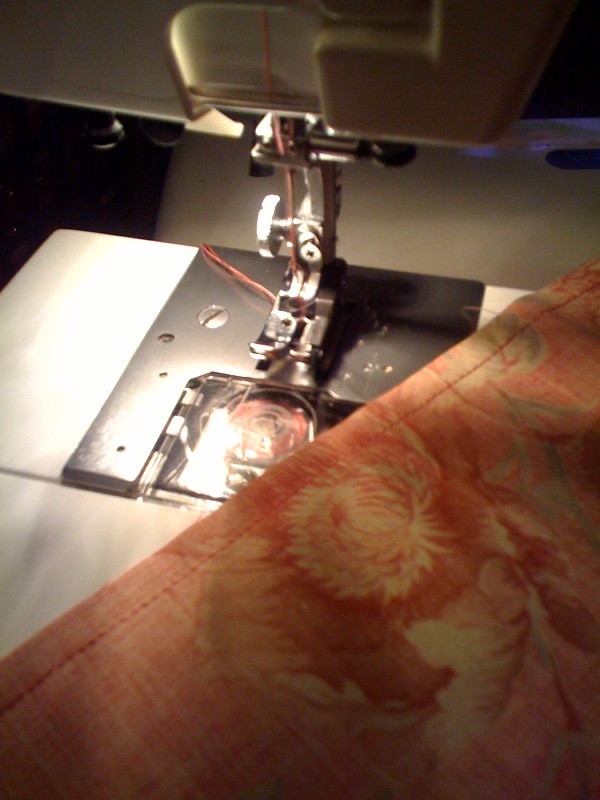 *IMPORTANT TIP* The Punch needle works like a little beauty when you use tearaway on the back of your fabric. The punch needle can be iffy on quilting fabric but it ceases to be an issue with tearaway, and whats more you can tear it away at the end! Bonza. Be doing this again. I pressed as I went. So my front is ready. 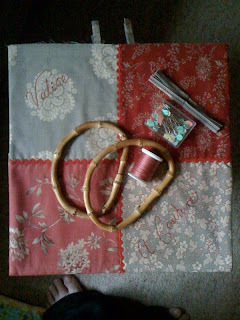 I then decided to be really daring, and sewed my smaller square of batting in between that last two remaining red squares. And pressed it. Woohoo. I then decided to tackle the side flaps. I put two triangles right sides together, PUt in my loops where I wanted them to go and then sewed down the longest edge and the short edge leaving the middle length edge unsewn. The unsewn edge will be the edge that gets sewn to the edge of the main panel of the carrier. Turn the triangles inside out and press 'em. 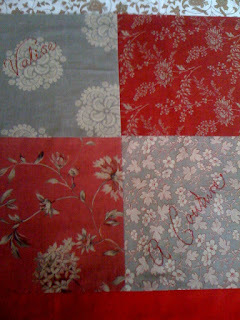 I also decided to add some yummy vintage (1950s) red ric rac to the main square as well. Because I could. So there. I then placed the triangles on the edges of my main square. 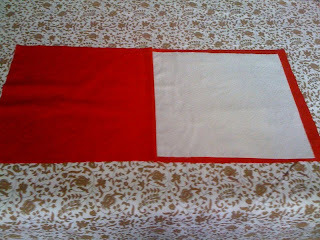 I then put the all red squares with the batting attached face down on the red and main square with the batting on the back. Pinned it all in place and then worked out where the tabs for my handles were going to go on the bottom of the red squares and pinned them in place. 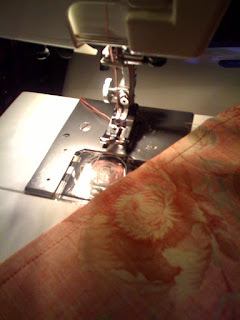 I then sewed around three sides of the carrier leaving the top open. I turned it inside out and pressed it. I then got the craft wood piece and pushed it into the opening and down to the boom. It will be snug fit but it will fit. Takes some wriggling but it works. I then attached one of my handles to the bottom of my block carrier. So, the Carrier is nearly done. Its now down to the fiddlies and final pics, and as I said, I'll post that tomorrow or the night after. Now I am off to post this and finish up the carrier. 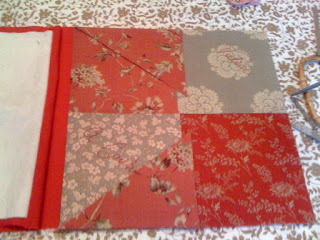 D.I.Y Block Carrier ... sew along anyone?